Ok, so I basically lied, I said I wasn't going to post a picture of the piece on but here it is anyway. Yup, two opposing posts within a few minutes. That's what coffee does to me. That's the dress I plan to wear it with too. It's for an outdoor wedding of a dear friend of mine and shoe attire needs to be quite casual, so I still need to decide how to adorn my feet. That, though, is not an interesting topic for a knitting blog. I really need to model this, as flat, it just seems so, well, flat, but I don't have time right now, so try to use your imagination. Click the image to see a larger view of the piece. 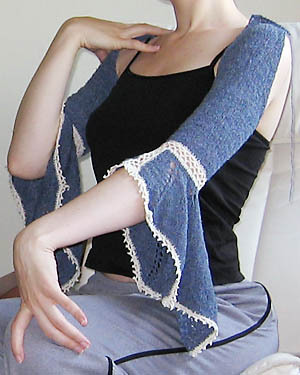 It's a glorified shrug in that it's really just meant to keep one's arms warm and would be worn over something else. I suppose a more brave woman than I could wear it alone. It's basically done, I'm just finishing up the closure. I may make some small accent to cover up the little overlap and hook and eye but, for all intents and purposes, this piece is done. When I can, I’ll post a picture of me in it so you can really see what it should look like. 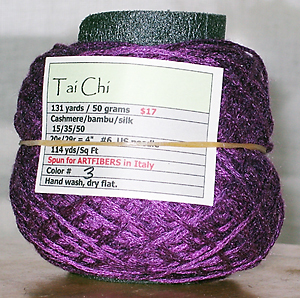 In other news, I have this lovely yarn in my possession. Can you see the yarn makeup? That's Cashmere, Bamboo and Silk. It's not actually as shiny as my flash would have you believe, but the color is fairly close. It's a lovely plum purple shade. 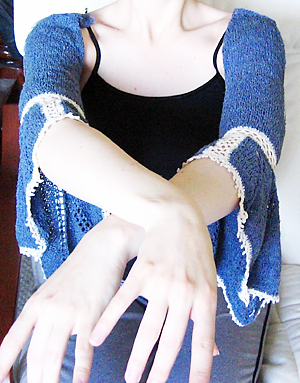 I've finished the sleeves on the Mousse piece and I think they are looking pretty nice. Now I'm working on the body. I'm kind of winging it right now, we'll see if I like what I get. Here are a couple pictures of the sleeves as they are right now. I haven't made too much progress on the poncho, I plan to work that when I don't want to have to think or when I need something portable. The mousse piece requires all my concentration, a pad of paper, pen, row counter and some math skills. Once I start decreasing for both the raglan and the neckline, I'm really going to need to keep track of what I'm doing. On a side note, is it obvious that I have big monster man hands? Here are a couple lightly blocked squares from the future poncho. 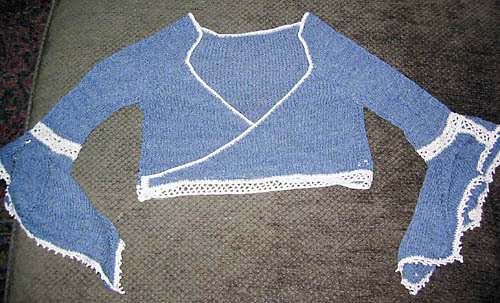 The neck and front placket will be worked in knit ribbing in whatever color I have enough of when the crochet is all done. I'm not sure what kind of closure I'll use, probably buttons, but maybe snaps if I can find some good heavy duty ones. As much as I love love love to crochet, the one thing I dread, especially with motif style pieces like this, is weaving in all those ends. Wool is a bit easier as the yarn tends to hold onto itself, but cotton is unforgiving. Since I want mom to be able to wash this regularly, I'll have to be diligent in securing those ends well. I've finally gotten around to really starting the poncho for my friend's daughter. It'll be worked in a modified granny square that really won't look so granny like, I swear. The camera is in not at hand, right this minute so I'll have to post pictures a little later. 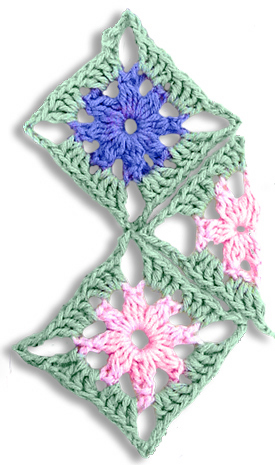 It'll be worked in shades of pink and purple for the centers and surrounded by green. This would all sound more tantalizing if I had partaken of some coffee at this point in the morning. The squares are about 3 inches wide and 4 inches diagonally. The piece will be 7 squares by 7 squares and I'm trying to design it so that it opens and closes in front like a cardigan so it doesn't have to be pulled over the little girls head. I'll try to get an illustration up soon. I would also like to clean the house, do some laundry, spend time with friends, balance my checkbook and end world hunger. I'll be happy if I cross one or two items off that list. So, I'm always hearing about women who never get tickets. They say they just cry or bat their eyelashes to great effect. I've been pulled over three times in my life and all three times I've walked away with a ticket. Now, granted, I'm always guilty of the given citation, but it'd be nice if once, ONCE, I were let off with a warning. I guess this time I really had it coming. I paid my car registration twice this year and even received a refund for which I, luckily, brought my receipt, but I've never gotten my stickers and registration in the mail. I tried calling the DMV a couple times but who has 3 hours of their life to flush down the toilet? Not I. No excuse, I know, but a bummer none-the-less. Luckily, in California, the officer can mark the infraction as "correctable" meaning I can right what's wrong and be off the hook. So, I know what I'll be doing on my lunch break tomorrow. Either I'm being entirely flakey or our digital camera is in Leo's car. Either way, I'm not posting any pics this morning because I can't find the camera. Maybe I'll come home tonight, ask Leo where the camera is and he'll say "Silly, it's been right here [insert obvious location] all day." Anyway, we're all going to use imagination time to picture our current projects. I've made a little bit more progress on the mousse piece though it's been a side project while I work my more pressing projects. I don't want to completely put it aside or I'll lose my impetus for it and it'll be relegated to the forgotten world of UFO purgatory. Sad indeed. I got a little envelope of beautiful pink swatches for a super secret, I can't tell you, no hints at all, project. Sheesh, if I hype it too much you'll think I'm knitting for world peace or something. I'm not. That's all for now. I have to get ready for work. I just don't think sweats and a buffalo plaid fleece are going to cut it in corporate America. Is worth two on the needles. 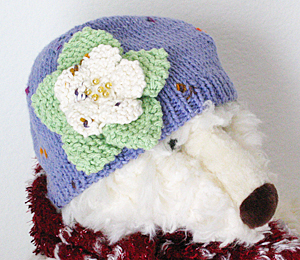 I finished up the hat last night and I think it's just adorable. 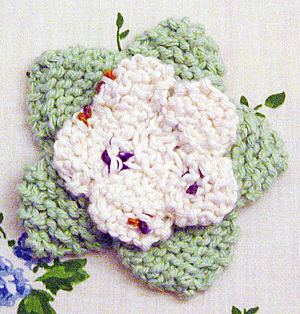 I added some beading in the middle of the flower for a little extra flair. My head, as small as it is, obviously isn't small enough to model this piece so I had to employ the noggin of a local stuffed bear. 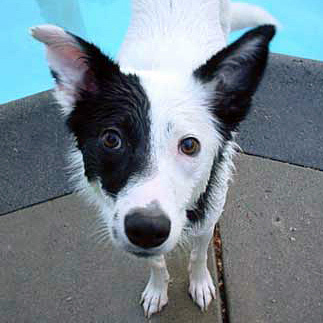 His ears add a bit of bumpiness, but I think you get the idea. I make hats all the time. They are the first project I started when I got back into knitting a couple years ago. I can make a hat in my sleep and yet I've ripped out this hat I've been working on three times. This would be one of the two projects I've begun as gifts to a couple of friends' daughters. The hat in question is an infant sized version of this hat. I'm using a different yarn at a different gauge in a smaller size than called for in my original pattern and my first couple of attempts just weren’t producing the right shape to stay snuggly and comfortable atop the head of a little cutie. I think I have it now, but I was starting to feel a bit less than friendly towards the project. It's not much to see right now, so I'll simply post the flower that will adorn it. It's made with yarn from my most recent order. 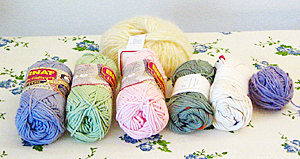 The image doesn't really represent the color perfectly, but I got some plain cotton in spring green, purple and pink, and some flecked cotton yarn in spring green, purple and white. 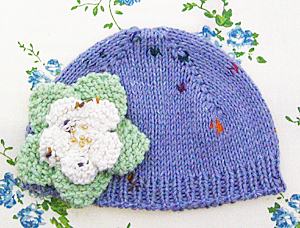 The little hat is worked in the flecked purple yarn with the flower above and the rest of the yarn will be worked into a little poncho for the other girl. There's also a little mohair blend there that I got to round out my order and play with a bit. I'm not sure what I'll do with it, I guess I just needed to own that much more yarn. I don't have a problem, I can stop any time. All patterns are free for non-commercial purposes.